With this battery operated Peg Perego John Deere Gator Ride On XUV, your little one can have an epic adventure! If you have a kid who loves the outdoors or all things vehicular, this ride on tractor will give them something to smile about. It can be driven on all types terrain and goes forward and reverse at two speeds: 2.25 and 4.5 mph. For increased safety, parents can use the 2nd gear lockout feature. This prevents little riders from reaching full speed. This item features super traction wheels and runs on a rechargeable battery. Both charger and battery are included. It can be driven by children ages 3 to 8 who weigh up to 130 lbs. Not only will your child be able to ride, but they'll also be able to carry items in the extra large dump bed with opening tailgate attached at the back of the vehicle. Playing in the backyard has never been more fun than with this awesome ride on toy. Made in the USA in our Fort Wayne IN Factory using domestic and global components. 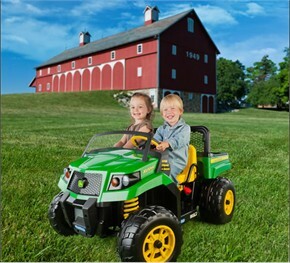 Availability: The Peg Perego John Deere Ride On typically ships within 2 business days.